I've been reminded by a friend of mine who would love to go on board. 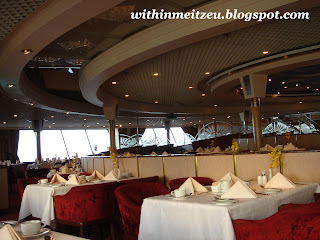 Some old pictures during the Star Cruise Trip on Superstar Gemini. 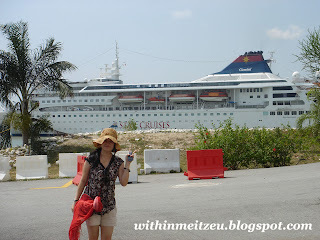 Remember to take a picture with the Cruise!!! The Restaurant where we had our Gala dinner at night. Aww.....I miss that trip, where peoples treating us like someone respectful and about the foods....OMG!!! It's all free and all you can eat from Blue cheese, chocolate day for those who depart from Singapore, pastry, BBQ lamb, beef, salads.... too much to mention, but remember!! Except liquid drinks that we have to order & pay for our bill, just like any hotel. No free alcohol. We saw some people ate so much that they have gain their weight but that didn't include my family...lol. Never been to Star cruise before. 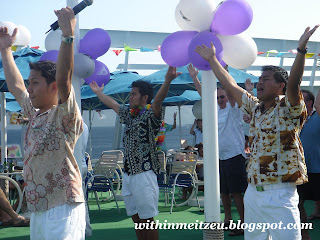 Been to the cruise from Oslo to Helsinki long time ago. Who is this travel agent? Chong Fui? Any places u want to go within sabah & sarawak. They got provide the package too. oh ya...ignore the price...price are not that expensive actually.